The LapTalk Computer for visually impaired is the most intuitive computer access solution for the blind available. The LapTalk empowers visually impaired users to instantly “get online” with no training required! Plug it in, and you’re ready to go. It isn’t just a screen reader… It is far more than just a computer…. It is a complete solution for the visually impaired individuals! The Laptalk is an assistive system designed with the blind and visually impaired in mind to be as simple and intuitive as possible. Users of the Laptalk have said it is “Amazingly simple” and “Menu driven, equipped with everything a visually impaired person could need”. The Laptalk is customized to each individual’s needs. 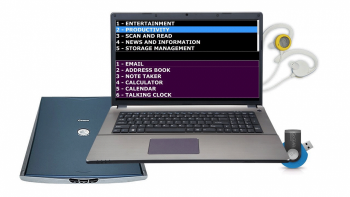 The system comes preconfigured with an e-mail account, many news sources, radio shows, accessible to audio books, scan, magnify and read capabilities, games and other features. The Laptak system includes already a computer, a scanner, MP3 player, unique “open ear” headset, it is pre-loaded with all software components and most importantly – customized to the specific customer’s settings. The Laptalk is customized to each individual’s needs. The system comes preconfigured with an e-mail account, many news sources, radio shows, accessible to audio books, scan, magnify and read capabilities, games and other features. Users of the Laptalk have said it is “Amazingly simple” and “Menu driven, equipped with everything a visually impaired person could need”. Software features: emails | Web Searches | Talking Encyclopedia | Audio Books | Screen Reader | Games | Scan & Read | Archiving | Much, much more! !